This modern, responsive template built for Professional Shopping Websites including 4 differents homepage slider, unlimited color and font options. 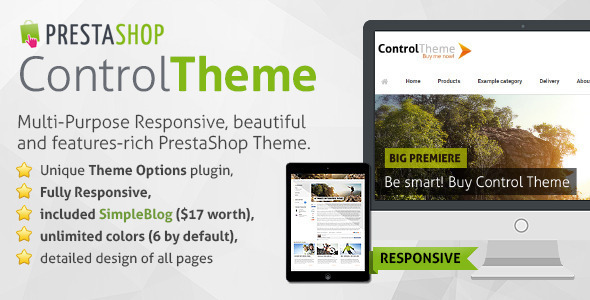 One of the best feature of this PrestaShop Template is the blog extension. Recommended for everyone, who would like a trendy, cutting-edge template. The theme isn’t free, but for this professional work, it is worth every cent. Autumn PrestaShop Template also has a responsive layout with clean and simple design. 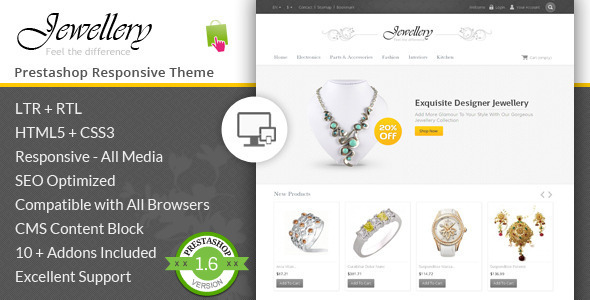 You can use it on any PrestaShop WebShop. Features including unlimited color variations, FrontPage Ads and Mega Menu modules and many more unique customization options. This MultiPurpose Responsive PrestaShop Theme will bring you a full variety of customization options. Almost 200 options waiting for you on the administration panel to make your webshop really unique. Furthermore, it is contains a thumbnail displayed ajax search and integrated SimpleBlog module, which worth 17$ value. Get this ultra-modern PrestaShop Template and increase your sales. If you would like a minimalist PrestaShop Theme focused on your content, you found the one of best for you. Jewellery has a strong advantages thanks for the included Revolution Slider ($15 value) and the lot of customization options.